The roofing style that you decide on when building your new home plays more than just a supporting role. It can reduce energy costs and significantly boost the street appeal of your home. Q " The roof really sets the tone of the architecture and can form the foundation for many other design decisions. It's an opportunity to create something unique and visually appealing that can be carried through to elements elsewhere in the home." Jen Lambkin, Shaun Lockyer Architects..
Thankfully there are various options when it comes to roofing, varying from modern streamline, to traditional hip and gables that value class elegance. Whatever style you desire, Evoke Living Homes can help you achieve your desired look. A skillion roof entices those with a taste for modern design, and have a single level or split (double skillion) flat surfaces. This is different from a standard flat roof as it has a steeper and more noticeable pitch. Skillion roofs allow water to easily run off, due to their high pitch, making them perfect for high rain regions, however homes using only a skillion roof, can have problems in high wind areas. The most typical roof design, and well known for its triangular shape, the gable roof can be added to a traditional or modern home. It’s popularity stems from its versatility, and consists of two roof sections sloping in opposite directions and placed such that the highest, horizontal edges meet to form the roof ridge. A parapet wall is an external wall extending past the roof line and is a constructional and stylistic feature. A parapet may simply be the portion of an exterior wall that continues above the line of the roof surface, or may be a continuation of a vertical feature beneath the roof such as a fire wall or party wall. Parapet walls are often used to create a unique and dramatic profile to your home, and create a look that stands out from all others in your street. The Dutch gable is typically suited to a more traditional style of home and is a roof with a small gable at the top of a hip roof. 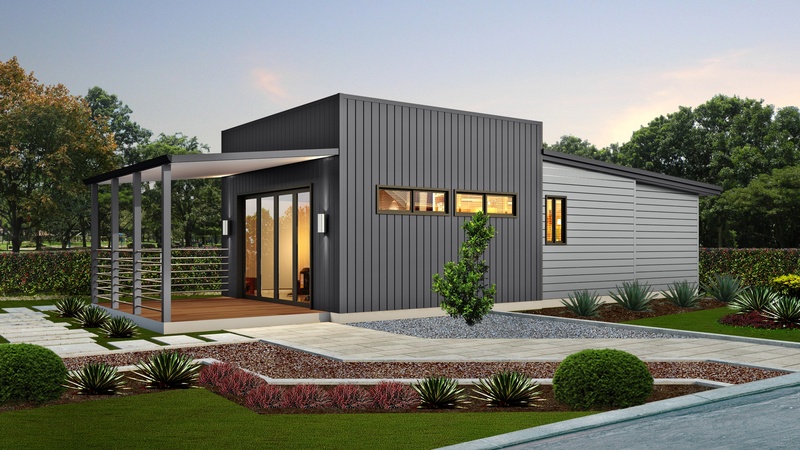 It compliments your home’s design giving it extra flair, and allows for sophistication, such as beautiful front porches, practical carports and luxury alfresco. The Preston, typically exemplifies this. The Gable Hip and valley again adds more sophistication to the look of your home, having a gable roof which has two sections sloping in opposite directions, as well as a section formed by several adjacent inclining planes, each rising from a different wall of building and forming hips at their adjacent sloping slides. So, which is best for you? Download our eBook to see different styles and types based on the Evoke Living Homes range. Of course, show us an image or idea, and we can work with you to achieve you dream home. Get the lifestyle you deserve.